Paula Lorimer makes sure there are no spaces in the diary for the Manchester Central Convention Complex. 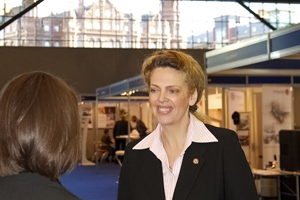 Paula Lorimer relocated to Manchester to join the Manchester Central Convention Complex as sales director in 2007, after working in exhibitions and events for Reed Elsevier and as event director for International Confex. She arrived just before the venue embarked on a three-year, £30m redevelopment, which was recently completed. The venue celebrates its 25th anniversary in March. 8.30am Arrive at my desk after the school run and meet with my four-person sales team, each one dedicated to a different business sector: national associations; exhibitions and events; international associations; and corporate and banqueting. My role as sales director is to use the new building to its maximum capacity. 9am Greet clients arriving that day, then start to show them around. This is prime selling time. We look at enquiries as a way to drive economic impact to Greater Manchester, currently valued at £56m per year. We host 150 events annually on average and are currently booking up to 2020 and beyond. We recently hosted the Chartered Institute of Personnel Development (CIPD) event with 1,600 delegates per day over three days. 11am Time to prospect for new business. I do a bit of hunting to poach from other venues or cities. My team has a targeted list for the year of around 50 clients. With three new meeting spaces as part of the recently completed phase three (with combined capacity for 900 delegates theatre-style or 510 for a gala dinner), we can move into the small-business market. As many clients booked more than three years ago, we're also now up-selling the new venue. 1pm Sometimes I'll take clients to lunch, or at other times I'll grab sandwiches, supplied by our in-house catering, while at a senior management meeting. I will also carry out a review with my general manager on how events went in terms of visitor numbers, then debrief and deal with operational issues. 3pm Work on proposals with the sales team. I will also take an hour to walk the floor and see how events are going that day. 4pm Review diary. This is the sanity check: I look for date conflicts, contracts up for renewal and spaces in the diary. We have a conversation every day to fill in the gaps. 5pm A meeting of the Manchester Hoteliers Association with hotel general managers from across the city. We share information and collaborate on some bids. I work closely with five hotels providing 2,500 beds within a five-minute walk of the venue, namely the Radisson Edwardian, Midland, Hilton, Premier Inn and Jurys Inn. 6pm I often have an evening event to attend. A big part of what I do is to act as an ambassador for the venue. Sometimes I will take clients for dinner and to current hotspots like restaurant San Carlo, or to see my beloved Chelsea play a local team. Otherwise I'll head home to my seven-year-old daughter. Since we moved to Manchester, we definitely have a better work-life balance.